Various intrinsic properties of the liquid, gases and plasmas, like compressibility, viscosity and density decides the flow characteristics, example, air flowing across the airplane wing, liquid flowing through pipe etc. 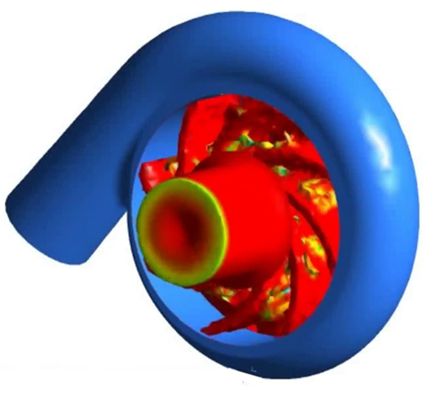 thus the study of the motion of these matters – Fluid Dynamics, provides us the better design, predictability, efficiency, and control of systems that involve fluids. 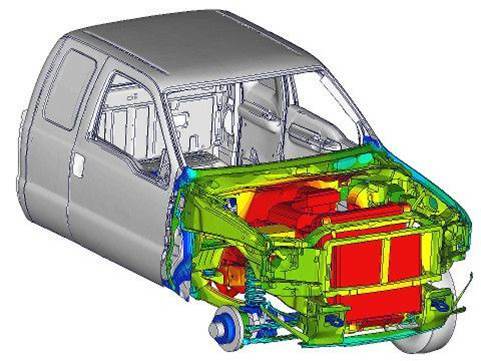 The subject has its influence on various fields like Manufacturing innovations, Aerodynamics Design sensor development and Automobile Designing. 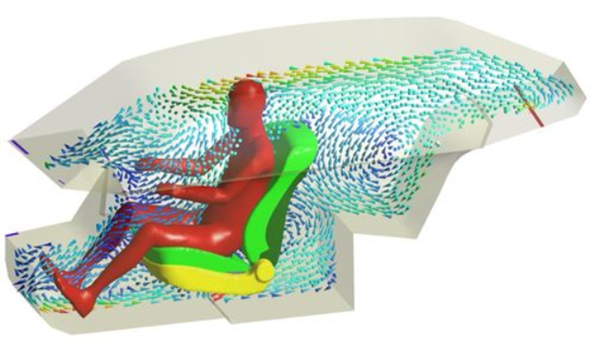 Aerodynamics is the interaction of air with a solid body moving through it and it has wide range of application like, Aircrafts Designing, automobile, railways etc. As the requirement of powerful automobile engine felt, the Aerodynamic Design came into play a major role nowadays. Ultimately the engineers configured that Wind Resistance significantly hindered their speed, hence focus was shifted on the Aerodynamic aspects of the cars in the manufacturing domain. With the potential of gains promised, DEP can provide the best aerodynamics design that substantially increases the efficiency of the engine. 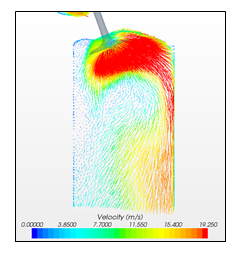 Progress in understanding and predicting the aerodynamics of flow over wings and bodies has been spectacular, and our engineers follow the required mix of experiment and empirical discovery, together with simple and non-simple flow models. 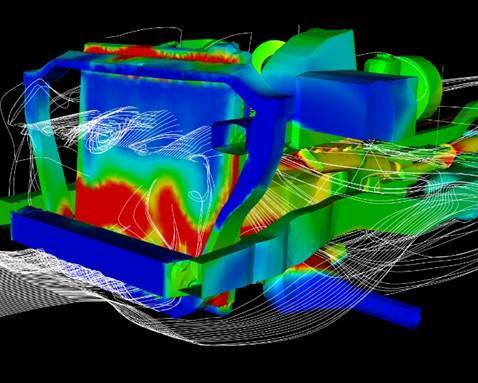 Aerodynamics characteristics enormously affects the vehicle performance and fuel efficiency and vehicle stability. 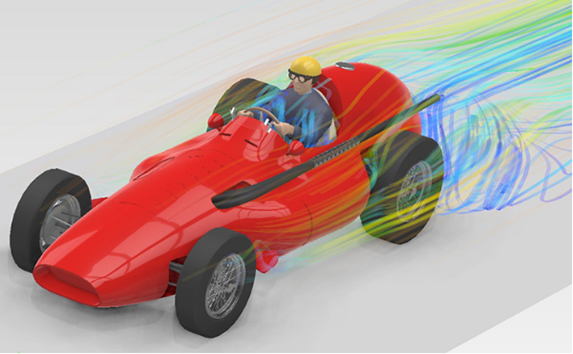 The main concerns of automotive aerodynamics are reducing drag, reducing wind noise, and preventing undesired lift forces at high speeds. DEP is providing effective solutions in optimizing lift to drag ratios and balancing overall performance with size. 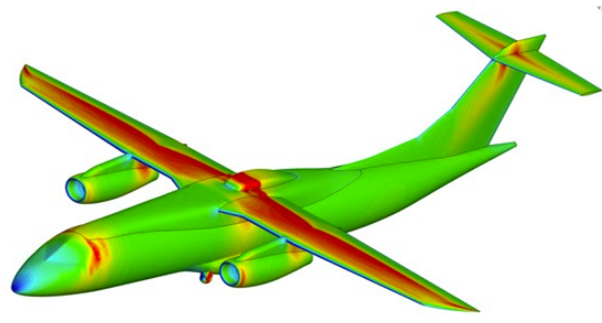 Drone aerodynamic simulation is used to improve the aerodynamic performance and reducing the drag of Drone. 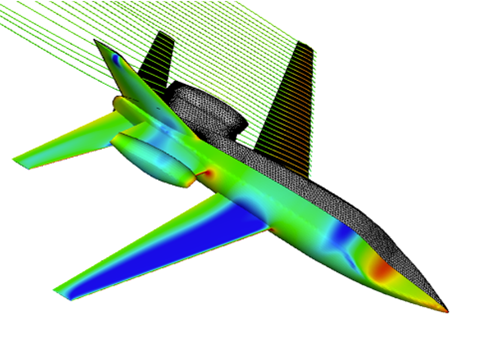 Objective of the simulation is to make accurate predictions of aerodynamic forces, Lift and Drag Coefficient etc. 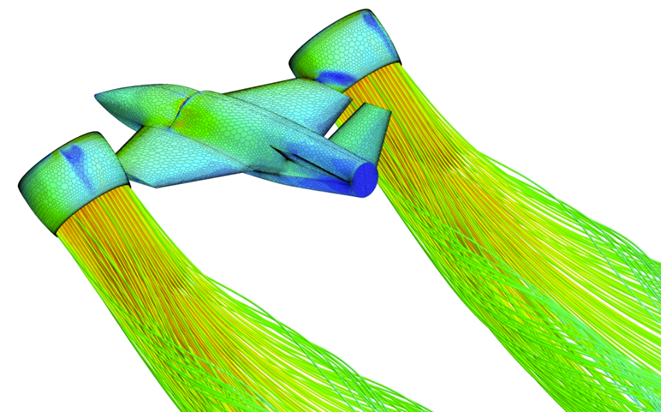 While aerodynamics is at the core of all aerospace engineering programs, the broader discipline of fluid mechanics, encompassing both aero- and hydrodynamics, covers a vast array of topics. 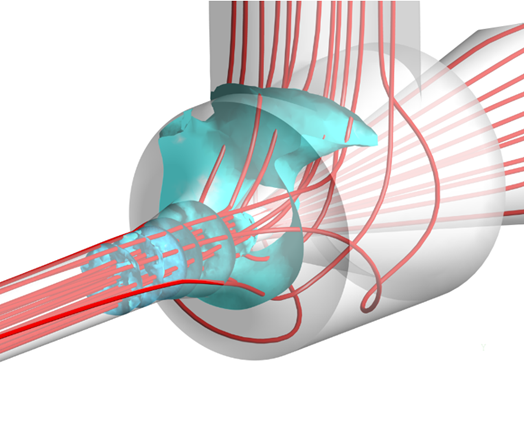 Fluid Flow is a part of fluid mechanics and deals with fluid dynamics. Fluid is a substance, such as liquid or gas that can flow, has no fixed shape and offers little resistance that has no external stress. Motion of a fluid is subjected to unbalanced forces or stresses. Fluids are deformable to an unlimited extent, and yield in time to very small disturbance forces. Consequently, their motions are frequently very complex, and even rather straightforward fluid flow configurations can produce flow fields with nontrivial solutions displaying very complicated dynamics. Despite the fact that the governing equations are usually well known, the vast majority of fluid flows cannot be solved directly by brute force calculation, and the subject requires a close collaboration between theory and experiment. This coupled effort, together with increasingly effective use of carefully-selected, large-scale, direct numerical simulations on the computer, results in a field which has remained vigorous, challenging and exciting for over a century. The main objective of this analysis is to provide the adequate comfort level to the drivers and passengers inside the cabin. Cabin cool-down and warm-up times are not only key design requirements, but are often need to be regulated. 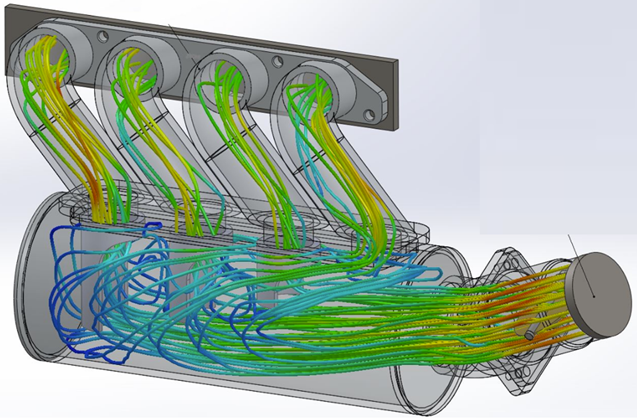 HVAC simulations helps in optimizing the HVAC ducts sizing and vents orientation and also velocity distribution inside the cabin for thermal comfort of driver and passengers. We have capability to provide effective solution for automotive Heating Ventilation and Air Conditioning (HVAC) system to optimize defroster, demist and passenger comfort mode. The uniform air flow at the outlet duct faces and distribution between different duct outlets with minimum pressure drop in HVAC system can be performed for passenger comfort. 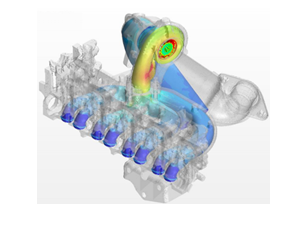 Engines development is involved with complex fluid dynamic interactions between air flow, fuel injection, moving geometries and combustion. 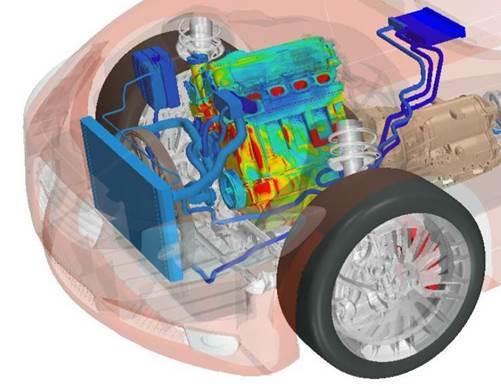 The design problems that are encountered include port-flow design, combustion chamber shape design, variable valve timing, injection and ignition timing, and design for low or idle speeds. 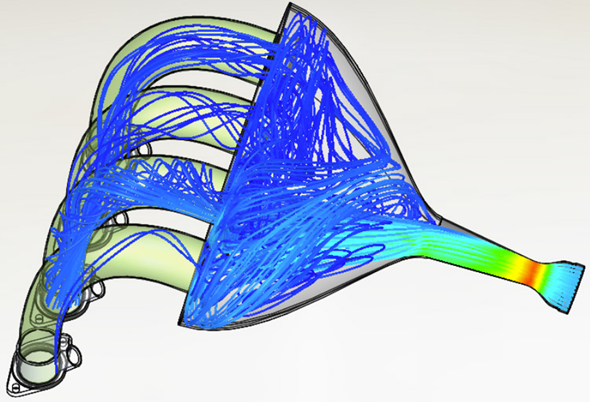 Using CFD results, the flow phenomena can be visualized on 3D geometry and analyzed numerically, providing tremendous insight into the complex interactions that occur inside the engine. 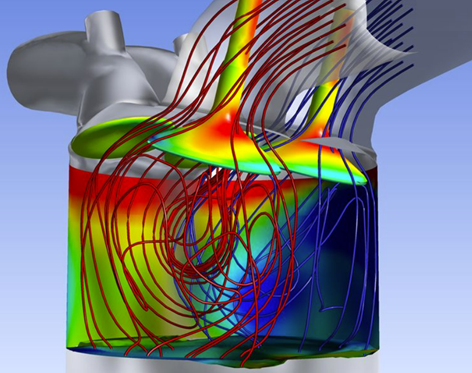 This allows you to compare different designs and quantify the trade-offs such as soot vs NOx, swirl vs tumble and impact on turbulence production, combustion efficiency vs pollutant formation, which helps determine optimal designs. 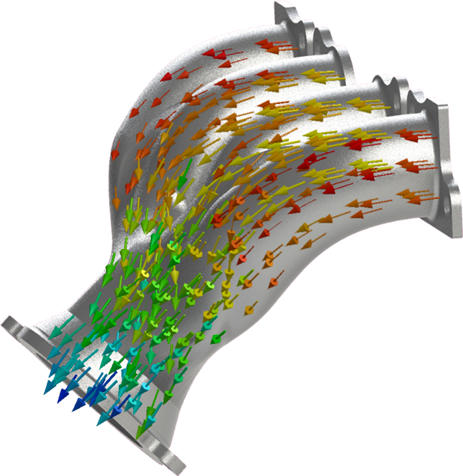 We have capability in port flow, cold flow, spray, combustion, and full cycle simulations. 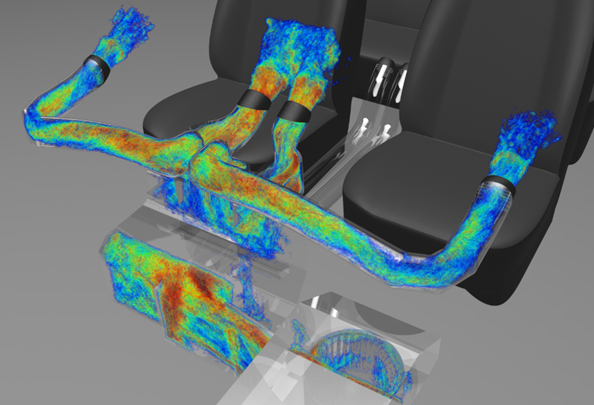 CFD analysis is used extensively as part of the design process in automotive engineering, power generation, and transportation. 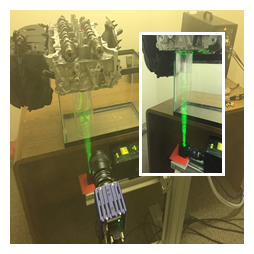 Our main aim is to deliver the valuable solution in combustion to predict Spray, Turbulence and Emissions characteristics accurately for improving engine performance. 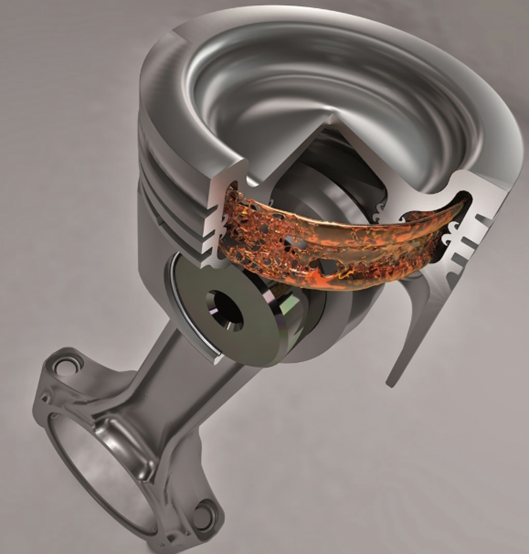 It provides deep insight into injection, vaporization and complex combustion chemistry in the engine. 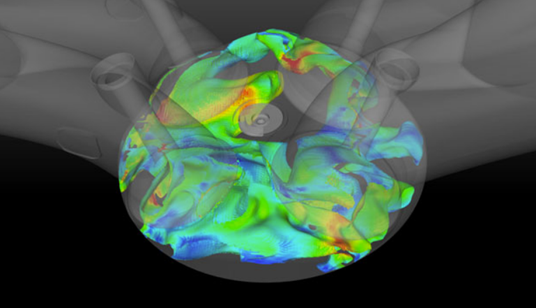 Computational fluid dynamics (CFD) is an efficient way to optimize the aerodynamics of a vehicle or to investigate the under-hood flow, especially the mass flux through the heat exchanger package. 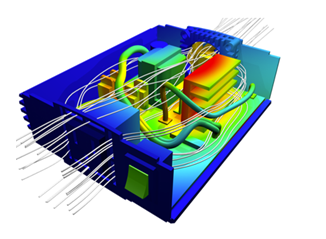 Conduction, convective heat transfer and thermal radiation will be consider in this simulation. 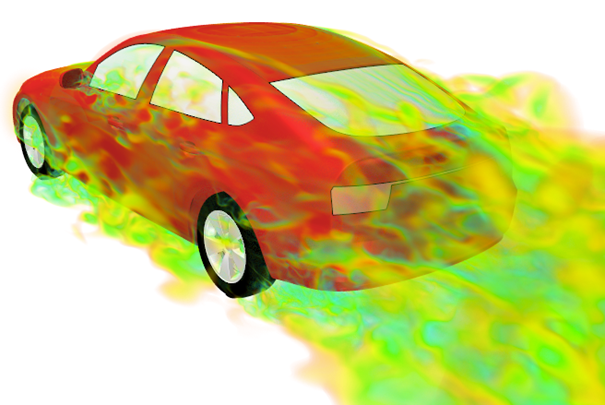 Under-hood flow field and air temperature distribution is calculated using CFD analysis. This helps in judge the performance of the engine fan and vents as well as look for hot air spots within the under-hood to improve the thermal protection of a vehicle. 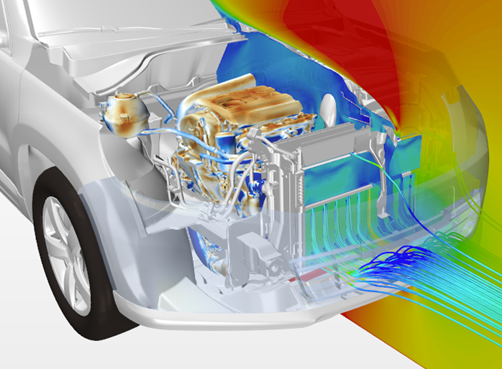 DEP provides solution for full Vehicle under hood systems thermal management and exhaust heat protection. The air flow around the heat exchangers and under hood component temperatures at critical loads are predicted. 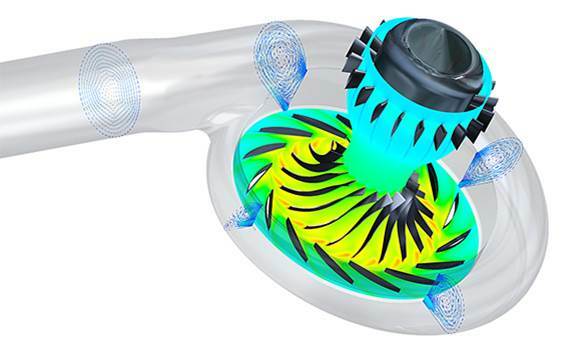 The combustion gases can be expanded in the turbocharger turbine to drive the compressor. The compressor’s task is to increase the density of the air admitted to the cylinder, thereby increasing the engine power output or allowing the engine size to be reduced without decreasing the power output. 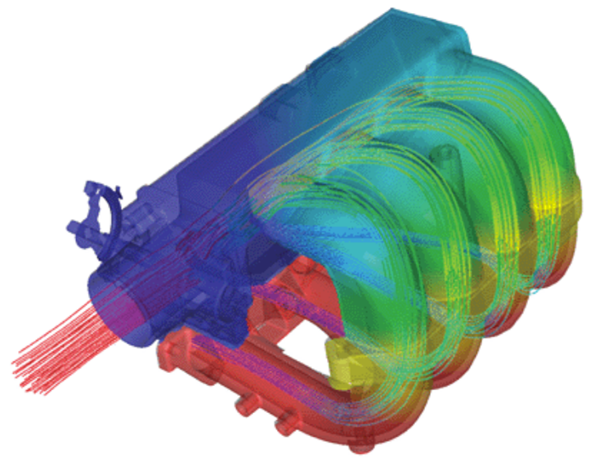 CFD simulations on turbocharger helps in maximizing the engine power output by optimizing the compressor and turbine blade profiles and various design parameters of turbocharger. Centrifugal pumps will convert the kinetic energy into pressure energy. 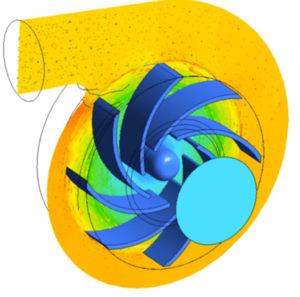 The shape of the impeller blades and diffuser are important to achieve better pressure energy and pump performance. 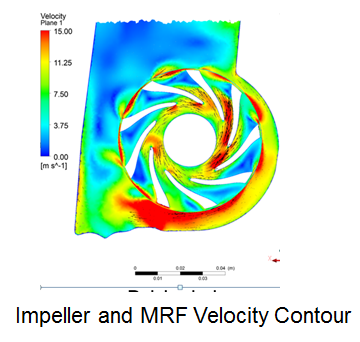 Pump flow simulations (CFD) helps in optimizing the impeller blades and shape of the diffuser to achieve better performance and improvement of pump discharge. 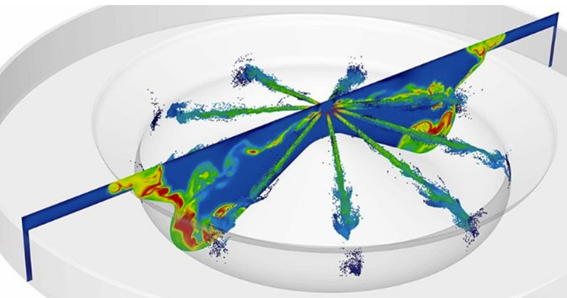 Pump flow simulation provides the pressure and velocity distribution inside the computational geometry and deep insight on fluid turbulence, cavitation and unsteadiness. 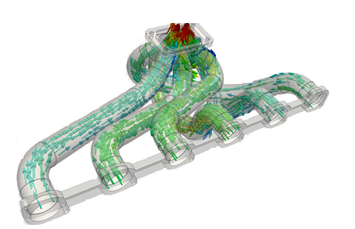 Intake manifold flow simulation provides the velocity and pressure distribution inside manifold. It helps to improve the volumetric efficiency, reduced in pressure drop by modifying the manifold design with minimal flow imbalance between the runners. 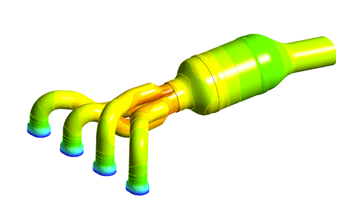 Exhaust manifold flow simulation provides temperature, heat transfer coefficients, velocity, magnitude and pressure distribution in exhaust manifold. It supports to improve the design to withstand at the higher temperature and reduce back pressure issues with minimal flow imbalance between the runners. 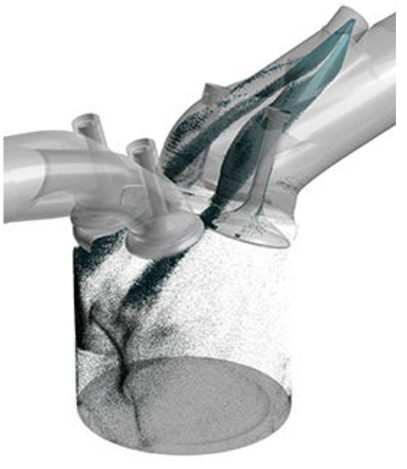 Primary objective of this study is to get insight of the flow field with bay-to-bay breathing holes open and closed. 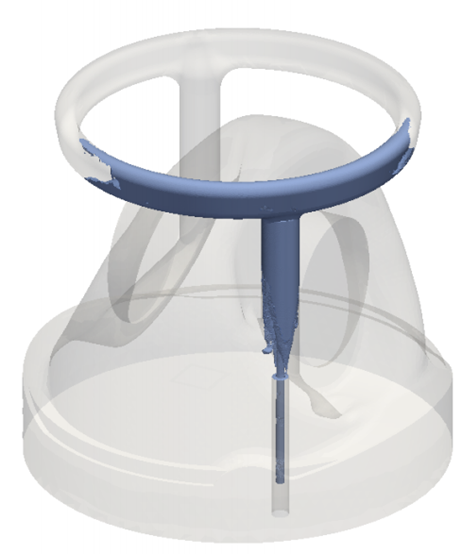 This study can also be used to predict pumping losses and identify low and high pressure regions for venting and drain-backs. Also, predict through comparative analysis the various designs of windage tray and make recommendations. 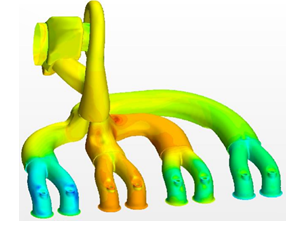 We have experience in virtual angiography to validate the CFD-predicted gross flow dynamics against the routinely acquired digital subtraction angiograms. 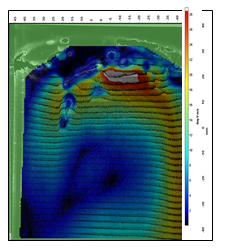 Toward a more direct validation, here we compare detailed, CFD-predicted velocity fields against those measured using particle imaging velocimetry (PIV) and its measurement mechanism. The cooling system is composed of six main parts—water jacket, a radiator, a water pump, a cooling fan, hoses, and a thermostat. 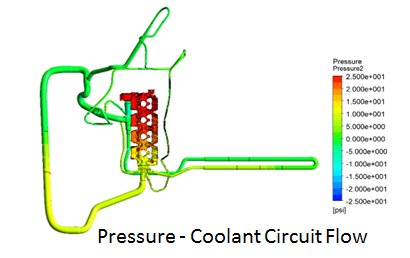 We have capability in coolant circuit flow analysis, which helps in to understand the behavior or individual components and complete cycle and we can optimize the parameter to maximize the cooling system performance. 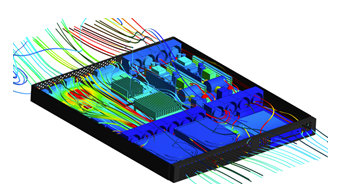 A CFD analysis is performed to evaluate the proposed cooling scheme of using a fan card to cool the printed, circuit boards within the rack. 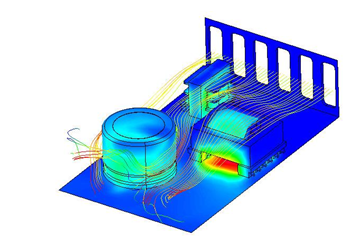 Electronic Box Cooling Simulation provides the temperature distribution of electronic components and it helps to improve the life and performance of sensitive electronic components. DEP providing thermal management solutions for a wide variety of electronic devices.